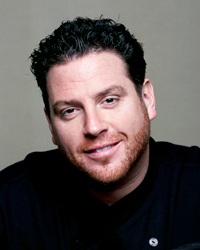 Scott Conant (F&W Best New Chef 2004) creates spectacular luxe Italian dishes at Scarpetta, with locations in New York, Miami, Las Vegas, Toronto and Beverly Hills. Here, he shares the secret to his most popular dish, his favorite Italian cookbook and a brilliant use for leftover wine. Our spaghetti with tomato and basil. In every restaurant, we sell almost 10,000 a month, it’s unbelievable. It always goes back to the same thing, the old da Vinci quote: “Simplicity is the ultimate luxury.” It’s the simplicity that resonates with people. It’s something they know, something they’re familiar with it, something they grew up with to some extent. I remember one time coming out of Per Se and thinking how the steak was the best dish of the night. How great would it be if you could take something that’s such a commodity in every restaurant—spaghetti with red sauce—and make that the best thing a customer has ever had? Nowadays, no matter what else I put down in front of people, they always tell me that simple spaghetti was the best part of their meal. I definitely think it’s the sum of its parts: we use all fresh tomatoes whenever possible, we use very little canned, if any. We use quite a bit of olive oil, which we infuse with garlic and basil and crushed red pepper, almost like a tea. Then we strain out those ingredients and put the oil directly inside the tomatoes. We only cook the tomatoes for 45 minutes. The fresh pasta that we use has a little semolina inside so that texture is another very important component. And we finish the dish with a touch of butter, fresh Parmigiano-Reggiano cheese, basil, and a little more of the infused oil. All of those are little things, but when you put them all together in balance, that’s the key. Le Ricette Regionali Italiane, by Anna Gosetti della Salda. It’s only available in Italian. My Italian isn’t that good, I only understand about 50 to 60 percent, but it’s still one of those books that you could sit there and thumb through for hours and still find new information. It’s an incredible resource. My second favorite is The Escoffier Cookbook. It’s still so amazingly relevant. When I’ve become bogged down and can’t think of new menu items, I’ll go through books to jog my memory. And every single time, I pick up Escoffier and it gets my mind working again. It describes every dish from the largest ingredient to the smallest, which helps me think about the flavor profiles, and it’s so comprehensive, it touches on everything. It’s relevant to more avant-garde styles of cooking and to more traditional styles. It’s everything a cookbook should be—something that’s going to sit on your shelf forever and still be relevant this many years later. How to make a perfect omelet. You can start with cold eggs, since no health department is going to allow you to keep eggs at room temperature. Though what you do at home is completely up to you, and I love the idea of room-temperature eggs. For an omelet pan, I prefer a perfectly seasoned 8-inch sauté pan, but I know how much people love their nonstick pans. Lately I’ve been using Demeyere pans quite a bit, and I’m really pleased with them—I like the handle, the way the heat carries through the whole pan. The key for me is getting the pan to the right temperature, and not too hot so you don’t brown the eggs. I pour in the eggs and stir until the eggs begin to set, then I’ll level out the mass of egg to fill in any holes, and then let it finish cooking on the stovetop. The key for me is getting the pan to the right temperature: If it’s too warm, it’s going to brown, and I like my eggs a little undercooked as opposed to overcooked. So I want my pan hot enough but not too hot. What a great entertaining tip? Since there always seems to be some leftover wine—not in people’s glasses, but in the decanter or the bottle—I’ll take that wine, add some vinegar to it, and then use that for salads and other vinaigrettes after a couple of weeks’ time. Let’s say you have 2 cups of wine leftover: I’d add about a 1/4 cup of vinegar to that at most. That’s your starter—or what they call the mother. Put a cork in it and let it sit on your counter for a few weeks, the mother will turn the rest of the wine to vinegar. Sometimes when I tell some people that tip, they like to tell me there’s never any leftover wine in their house. So here’s another tip: Don’t drink so much. Leave some left over for your vinegar. Why Because he has such a good time honoring the full spectrum of Italian cuisine, whether it's rustic homemade pastas or a refined truffle-infused mushroom fricassee. Experience Bayerischer Hof, Germany; Barolo, San Domenico, Chianti and City Eatery, New York City. Why he became a chef "At my vocational high school, the plumbing class was full. So I took cooking and got really into it; at 15, I was carrying my Escoffier book in my backpack." On starting his career "When I was working at San Domenico, I slept on their floor every weekend because it was too late to get back to Hyde Park. It was so pathetic." Most memorable meal "When I was 22, I took a friend to the old Le Cirque for her birthday. The captain brought over Chuck Mangione, who was eating there, to play 'Happy Birthday' on his trumpet. And it was Le Cirque!" Second-most-memorable meal "A dinner I had by myself in Portonovo in Marche, Italy; I ate sea urchin on the beach with candles all around." Most humbling moment "I've had so many; they usually involve an Italian standing over me saying 'You stupid American.'" What keeps him going Coffee. "I drink about 15 cups a day. I make really good espresso."